Kazakhstan: Terrorist Plot — or Concocted Conspiracy? Bemused skeptics say the video and subsequent arrests seem like a convoluted set-up designed by security services to jail dissidents. Three men in plain white face masks gaze into the camera as they stand in front of a black Islamic-themed flag draped on the wall. The man in the center engages in a clumsy harangue, repeatedly consulting a script as he declares a violent jihad against Kazakhstan. A pair on either side of the speaker brandish what appear to be automatic rifles. The scene, which plays out in footage that was released to the media in November, is striking for its amateurishness. The security services took it seriously, however. This was, they insisted, sure proof of extremist plotting. Within a few hours of the video surfacing, law enforcement officers had detained a group of political activists and later charged three of them on terrorism offenses. Bemused skeptics say the entire affair looks like a convoluted set-up designed by the security services to jail yet more dissidents. None of the three men in custody is presumed to be among those starring in the video. One has been named as Oralbek Omyrov, who is accused of circulating the footage in the first place. The other two — Almat Zhumagulov and Kenzhebek Abishev — are suspected of conspiring to sow unrest with the ultimate goal of seizing power, security officials say. The investigation’s case rests in part on what they say are bugged conversations featuring Zhumagulov and Abishev, in which the pair are said to be discussing a plot to topple the government. The authenticity of the recordings is questioned by the accused. Zhumagulov and Abishev’s families and lawyers insist the charges are preposterous. As for Omyrov, nobody has come out to speak on his behalf. His story is so hazy that it has prompted supporters of his fellow detainees to accuse him of involvement in mounting a sting. The only thing that appears to unite the trio under investigation is that they were all members of an informal discussion club called Alash. Named after a political party that briefly governed Kazakhstan in the wake of the 1917 October Revolution, the group consists of politically minded acquaintances who met regularly in Mahatma Gandhi Park, in the city of Almaty, to exchange views on current affairs. There was certainly nothing conspiratorial about these encounters — they were broadcast live on Facebook. Zhumagulov and Abishev are confirmed, if very low-profile, detractors of the policies of veteran President Nursultan Nazarbayev. Zhumagulov exercises his discontent through pro-democracy campaigning. Abishev uses social media to spread his poetry, some of which touches on political topics. Omyrov, meanwhile, is a decidedly mysterious actor. He is said to have begun frequenting the Mahatma Gandhi Park meetings a few months before the arrests, but none of the regular attendees ever recalls inviting him. No lawyers, relatives or associates have been willing to speak on Omyrov’s behalf. Police have revealed only that he is 47 years old. No other information about his background is forthcoming. The authorities have let slip one more tantalizing detail, however. One of the three suspects has a prior murder conviction. Neither Zhumagulov nor Abishev have ever faced such charges, leaving just Omyrov. Omyrov is the only one in the trio with demonstrable links to the would-be jihadi propaganda material. In addition to the faintly surreal video that he shared on the WhatsApp messaging app with other Alash members, there is another snippet of footage that has been released by the authorities. 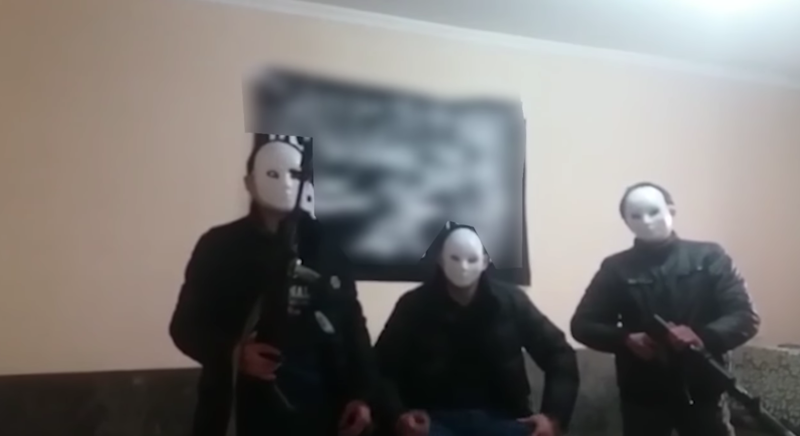 This other recording shows the moments just seconds before the purported jihadi video was filmed, as a shaven-headed and bespectacled Omyrov directs the masked men, instructing them to wave around their fake guns and to speaking threatening tones. It is not clear who produced this set of footage. When contacted by Eurasianet, Omyrov’s lawyer, Aydyngali Tabyldiyev, declined to discuss the case. Tabyldiyev said he did not yet know whether Omyrov would admit or deny the charges against him, but said that as far as he knew, his client was not cooperating with the investigation. These strange details have led Zhumagulov and Abishev’s lawyers and supporters to conclude Omyrov may have been a security service plant tasked with infiltrating Alash and helping frame some of its members. 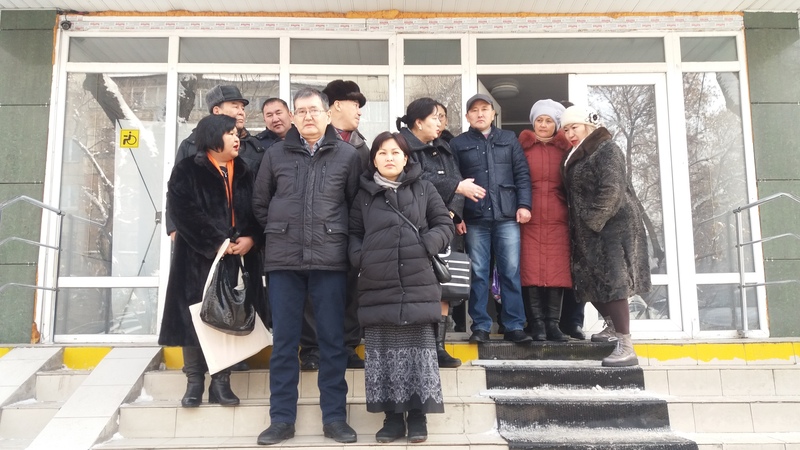 “It was a provocation,” Suyundyk Aldabergenov, an Alash member who has been questioned in connection with the case, told Eurasianet. Zhumagulov, 43, made no secret of his political sympathies. His Facebook profile displays the logo of a foreign-based opposition movement, Democratic Choice of Kazakhstan — or DVK in its Russian initials — bearing the slogan: “The time has come for change!” In a choice almost tailor-made to rile authorities, Zhumagulov uses a picture of DVK leader Mukhtar Ablyazov as his Facebook avatar. The other suspect in this case, Abishev, a 52-year-old security guard, uses his Facebook page as an outlet for his symbolism-heavy verse. Some works reflect on the state of modern social mores, while his more polemical writings take what appear to be oblique potshots at Kazakhstan’s ruling regime. One allegorical poem contains a Jungle Book-like cast of characters that describes the demise of a personality cult devoted to a lion that could be interpreted as an allusion to the prevailing practice of public fawning over President Nazarbayev. Although groups like Alash are tiny and marginal, their insistent focus on political issues that resonate strongly with large swathes of the population, especially ethnic Kazakhs — such as land rights, language policy, the rising cost of food and gas, and chronic problems in the healthcare and education sectors — provoke profound anxiety in a government allergic to any shoots of public discontent. Zhumagulov and Abishev have not openly dabbled with Islam as a rallying cause in their political activism, which makes the case against them all the more peculiar. Abishev is a practicing Muslim and prays at home, but he does not frequent mosques, his wife, Gulmira Abisheva, told Eurasianet. Zhumagulov’s wife described him as a “secular person” who does not pray. And it is not clear that even the authorities are fully committed to the proposition that Zhumagulov and Abishev are actually aspiring Islamist terrorists. Statements from investigators seek to convey the impression that while they believe Zhumagulov and Abishev were organizing violent activities that could be construed as the work of Islamic terrorists, they are not convinced the activists truly do subscribe to radical religious views. The purported bugged telephone conversations has a pair of men — identified by authorities as Zhumagulov and Abishev — discussing their alleged plot in exhaustive, highly expository and conveniently incriminating manner. The men in the recordings are heard to say they will set up secret terror cells, obtain funding and weapons, target law enforcement officers for intimidation and attack, and hack into video-camera surveillance and transport systems to create havoc as a prelude to seizing power. Even though defense lawyers refute the authenticity of these recordings, government-loyal media have made a splash of the official narrative. KTK, a broadcaster specializing in lurid and tabloid-like exposés, has depicted the accused as dangerous jihadis, thereby severely undermining any prospect for a fair trial. Asked by Eurasianet for comment and clarification on the case, the Prosecutor General’s Office did not respond before publication. The National Security Committee, known by its Russian-language acronym KNB, said it had referred the query onward to the Interior Ministry, which did not provide a response before publication. According to the few details that have been made public, Zhumagulov, Abishev and Omyrov are suspected of using an “unregistered public organization” as cover for plotting “actions in Almaty to breach public order, intimidate the public and sabotage the work of law-enforcement bodies.” Investigators say they are also probing the theory that this group was acting on instructions from “criminal elements hiding abroad from Kazakhstani justice.” They provide no names, but this wording could be construed as a veiled reference to Ablyazov. What exasperates the defense team is that investigators seem to be signally refusing to follow up their own leads. One attorney, Gulnara Zhuaspayeva, told reporters that the accused Omyrov in late November summoned Zhumagulov to an apartment rented by another man to meet with some prospective DVK supporters. While there, a group of these activists filmed a video clip criticizing the government. As can be seen in the shaky footage in this clip, the apartment is clearly the same one in which the “jihadi” appeal was filmed. One speaker is wearing a T-shirt identical to that worn by one of the masked would-be jihadis. Investigators are not known to have made any effort to track down these other individuals, although it should be relatively easy to do so. This has reinforced for some observers the theory that the affair was a set-up. Few are as uncomprehending and shell-shocked as Zhumagulov and Abishev’s wives. “He’s innocent,” Abisheva told Eurasianet flatly at the January 19 court hearing.